NINE-YEAR-OLD Bradley was living in an emergency homeless hostel with his family when he pricked his finger on an old syringe. The young child had been staying with his twin brother and their mother and father in an adult-only hostel in Dublin city after they became homeless. His mother Claire told RTÉ News at One that Bradley had pricked his finger the morning after the family first arrived at the hostel. “It was absolutely awful… not for families,” she said of the accommodation. Claire was speaking from the families new temporary home – the High Park Family Hub in Drumcondra in north Dublin. High Park was launched last month. At that time, the supported accommodation provided living space for 33 families who have been declared homeless. Families are given wrap-around support during the time they spend at High Park, and are appointed staff who work with them and help them secure long-term alternative accommodation. High Park is one of the first of the new Family Hubs – supported living facilities designed to get homeless families out of highly unsuitable hostel and B&B accommodation. A number of the hubs will be converted from hotels and B&Bs that have been used to house homeless families in the past. 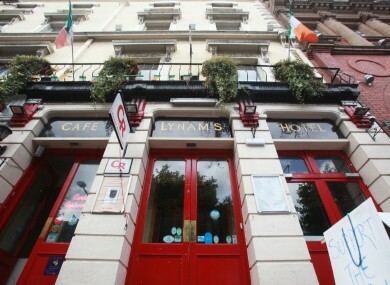 For example, the Dublin Regional Homeless Executive (DRHE) – which manages the homeless services for the entire Dublin region – has taken out a five-year lease for Lynam’s Hotel on O’Connell Street. This hotel – previously used to house homeless families and the site of a protest last August - is being renovated into a Family Hub. The DRHE has also bought a separate B&B to be converted for this use, and is looking to lease more properties for this purpose. The end goal is to have 10 to 15 of these hubs in order to provide accommodation for about 500 families. A spokesperson said that work was underway “to phase in the accommodation over the coming months”. The new hubs have been slammed by Anthony Flynn, director of the Inner City Helping Homeless group, as a “re-branding” exercise. Homeless charity Focus Ireland has also raised issues around the government’s long term plan for ending family homelessness. One of the most talked about aspects of last year’s Government Rebuilding Ireland Housing Action plan was the commitment to ending the use of private hotels and B&Bs to house homeless families. There were concerns voiced at the time that this would not be possible. The use of hotels and B&Bs to house families has skyrocketed since 2014, as the number of people presenting as homeless shot up. The problem is at its most acute in Dublin where demand for housing is highest. Figures from the DRHE show that there were 361 homeless families (with 768 children) living in private hotels in July 2015. By last month that number had more than doubled to 801 families (with the 1,623 children). Hotel accommodation is highly unsuitable – with many families not being afforded any proper cooking or cleaning facilities. Children having to sleep three to a bed, anti-social behaviour, damp and mould, bed bugs and mice are all common complaints raised. Despite the numbers of homeless families continuing to rise, Housing Minister Simon Coveney has repeated the commitment to ending hotel use numerous times over the past number of months. He told TheJournal.ie at the launch of High Park last month that the goal could be met. “I think so, I think so. I mean it’s putting a lot of pressure on people but I think so,” he said when questioned directly about the timeline. Minister Coveney with other TDs and officials at the launch of High Park last month. Coveney also repeated the assertion at the launch of the PRTB rent price report earlier this month, and has said it in numerous other interviews and speeches since last year. He has said that this goal would be achieved through a combination of rapid-build housing units, HAP tenancies and these new Family Hubs. The DRHE and the Housing Department have said that they are investing in the Family Hubs in order to move away from the highly unsuitable hotel use. Despite hotels and B&Bs being converted into hubs in some cases, a spokesperson for the DRHE said all buildings would be renovated to become more family-suited, and would have on-site supports. “The new family hubs will have the capacity to provide play space, cooking and laundry facilities and communal recreation supports,” the spokesperson said. However, Anthony Flynn of ICHH last week slammed the hubs as a “re-branding” exercise and a way for officials to “cover up figures”. “This will by no means help the situation, in fact it will make it worse. We will end up with overcrowded facilities that are not suited to means,” he said. More moderate criticism has also come from homeless charity Focus Ireland. Mike Allen – director of advocacy with the charity – told TheJournal.ie that the organisation welcomed any improvement in the standards of family accommodation. “We have been very critical with the quality of some of the accommodation which has been available,” he said. So anything that improves that is obviously a good thing for the families. So there’s a limit to how critical we can be about it. However, Allen said the government was lacking a targeted strategy to get families out of homelessness long-term. He said this was a cause of huge concern, and that investing significant time, funds and effort into these new family hubs wouldn’t help reduce the numbers. “Is this sort of an assumption that we’re going to have large-scale problem of family homelessness for along period of time?,” Said Allen. Minister Simon Coveney said that the Family Hubs will be used to improve the quality of life of homeless families, while the other elements of the Housing Action Plan come into effect. He has said repeatedly that he needs “time” before the housing output starts to meet the demand, and homeless numbers begin to reduce. Allen said this “time” -where families will start to exit homelessness and the numbers will reduce – is as yet undefined by any government strategy. Until then, Family Hubs are set to replace commercial hotels. The use of hotels and B&Bs to house homeless families (except in limited circumstances) may well be ended by July, said Allen. However, if month-on-month trends continue, the number of homeless families in Ireland will be higher than ever. “Where the criticism arises [of the July plan] from is the suggestion or the presentation of it as something else, something more monumental,” said Allen. At High Park last month, nine-year-old Bradley and his brother spoke about how much better High Park was to live in than their last accommodation. “It was like living in a basement there, but here I get my own room and I get to watch TV,” one of the boys said. “It was like one room and a kitchen and there was no other families there and we did have no friends to speak to or anything,” said the other boy. But here it’s better because we have our own rooms and our own beds. Read: Over 198,000 empty homes in Ireland: UK officers turn them into housing – would that work here? Email “'We have our own beds now': Will family hubs be able to replace hotels for homeless families?”. Feedback on “'We have our own beds now': Will family hubs be able to replace hotels for homeless families?”.